I am looking to buddy read this year…. Hmmm, I’ll play! Let me go gather a list. A buddy read is where we agree upon a book and read it during a certain month and talk about it during the month. These are just the books that I’m looking to do this year. Also my list is for two different challenges I’m doing the A through Z Challenge and also the modern mrs. Darcy challenge. That’s why some letters have 2 books. What do you like to read. I’m about to read The Count of Monte Cristo. It’s a reread, but it’s been a while and I NEED IT! My stack for my next reads, not in order. 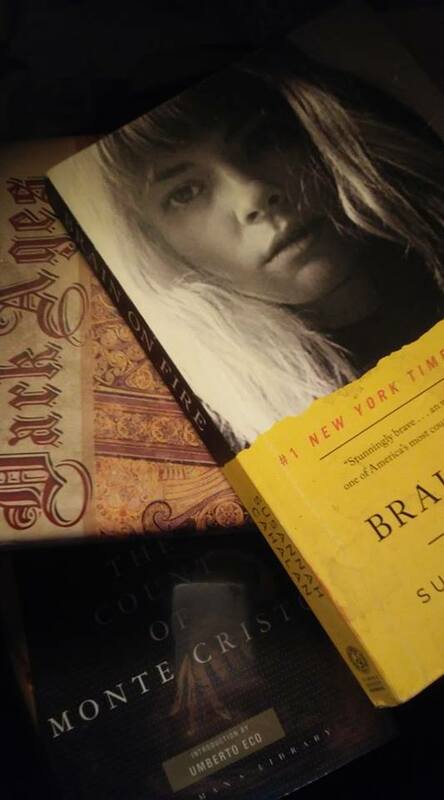 First The Count of Monte Cristo by Alexandre Dumas, then Dark Ages by Valerie L. Price again, then Brain on Fire by Susan Cahalan, which I haven’t read before. It looks awesome. It’s where two people agree on a book to read during the month and then read it at the same time I talked about it throughout the month. I would love to buddy read inkheart with you! That’s one I have been meaning to pick up.